9:55 am – No fish. I’m baffled. What happened to all the walleye? Okay, here’s the truth of it. For the next 20 minutes or so I change rods, lures, colors of Powerbait, everything I can think of that might turn my luck. I employ every technique, from trolling to casting to jigging. Heck I even stomp on the floor of my boat to try and wake up the sleeping ‘eyes to no avail. I know they’re there but I just can’t elicit another strike. This is where the lesson from my fishing partner comes in: he would tell me not to beat my head against a wall when I could be putting it to good use. It’s like the old cliche says: The light goes on and I know what I have to do. Move. 10:20 am – I arrive at a new spot not 3 minutes from “old faithful,” size up some structure, find a drop-off from 5′ to 12’, send my jig to the depths and…bam. Walleye! It’s one ‘eye after another for an hour straight. Here’s the what I learned. When I woke up this morning I was confident. When you put your mind to a task, and you truly believe in what you are doing, you will succeed, if you allow yourself to. As I hit the water, everything lined up: the sun was dancing on the perfect amount of walleye ripple, I had my favourite gear in tow, and to top it all off, today I had a cause. I could have stayed at my old faithful spot all day. The probability is high that I would have hooked into a fish or two, but a little persistence, spontaneity, and downright desire-to-succeed had me searching out those elusive walleye. It seems to me that too often in life we grow complacent. We stick to what we know because it’s safe and familiar, but today was a day for winners. Life should be about seeking out new experiences, taking risks, and learning and sharing with others. As noon approached I decided to give the fish a well-deserved break: they were great sports. 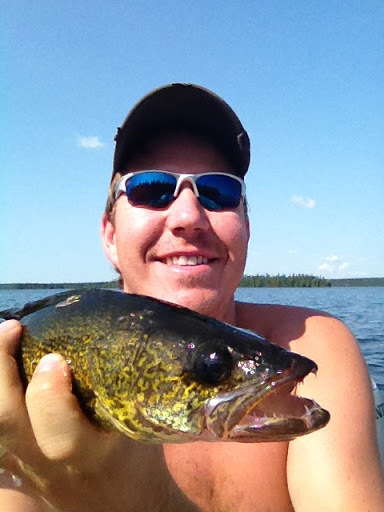 When I neared the dock, I guess my ear to ear smile gave away the secret of my adventures on Lloyd Lake. Within minutes I was sharing the newfound hotspot, named “1928,” with my brother. Whether fishing and seeking out new waters, or sitting in front of your computer reading this blog post, challenge yourself today and create a little glory of your own. 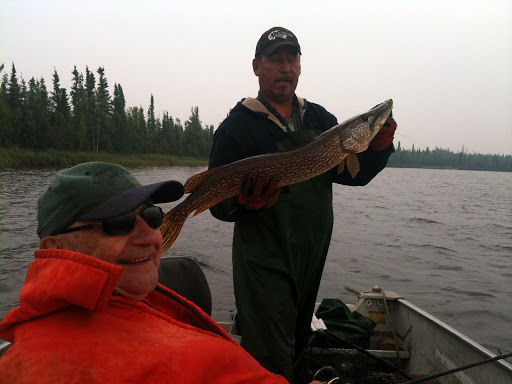 August 10, 2012: Slam walleye in honour of my grandpa. Mission accomplished.